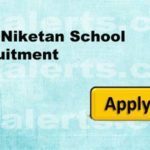 Advertisement For all the J&K latest Jobs, News, download JKalerts App Shiksha Niketan Sr. Sec. School Jammu Recruitment 2018. In latest employment notification school invites application for Teaching Jobs. Application with testimonial and photographs are invited which should reach this office on or before 15-07-2018 for the following posts. Private Jobs Jammu (A) PGT TEACHERS For (SR.